At the Top of Squirrel Spur: Bad Blogger! I don't know what has gotten into me lately, except that maybe the cold has made me lazy! I just haven't been in the mood to blog! And a lot of lovely things have been going on. Several meetings, which were important to me here in Patrick County but that I won't bore you with; wonderful morning walks under crisp starry skies with a good friend and dogs, chilly days tending rabbits with cat parading around my feet and romping through the barn, and wonderful golden evenings watching the shadows slide across the fields. I just haven't been writing! 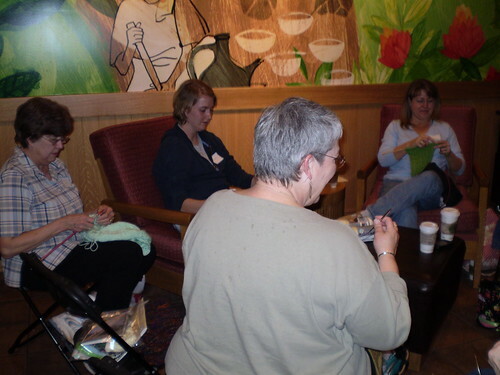 Stitching and talking away, with wonderful Starbucks treats! I ventured out of Patrick County yesterday, though, to trek to Danville for a knitter's gathering I heard about through Ravelry. It was pouring rain but a quick trip down, and I was greeted by lovely Robin, who helped organize the gathering, when I arrived at the Starbucks. Soon her mother joined us, and it wasn't long before a nice group of cheerful knitters came out of the wet weather to gather in a quiet corner of the shop. 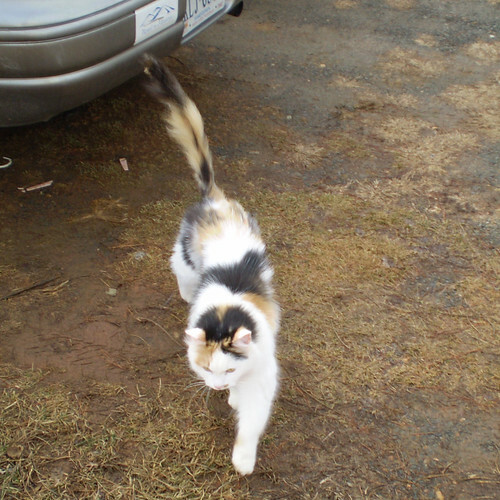 Sadly, our other hostess had a family illness and was unable to join us; many good thoughts were sent her way. 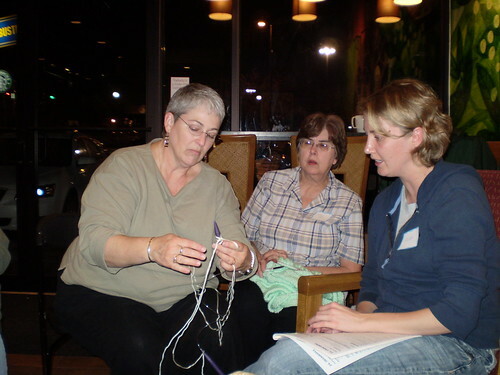 Robin got right to work helping other knitters with their projects while the rest of us talked and compared notes. I got to pass out business cards and it was fun to see how interested everyone was in the shop. Almost everyone had been to Meadows of Dan at some point! Robin explained about Ravelry and I think the group was intrigued. I learned about several Southside Virginia LYSs that I didn't know about that it would be fun to visit soon. 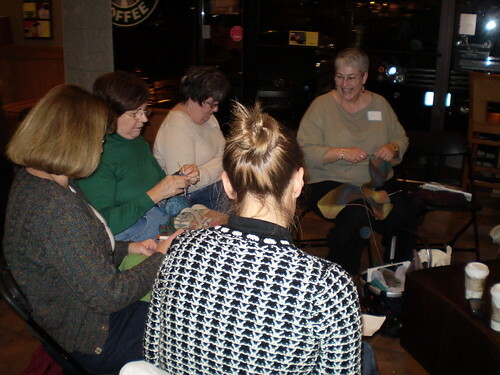 Lovely group of friendly knitters! There were other bloggers there, another spinner (who was knitting last night) and some very talented knitters! I saw beautiful cable work and elegant colors and some inspiring and challenging projects. I tried working on my poor simple sock but with so much going on I finally pulled out my trusty crochet hook; I can crochet and talk but knitting and doing anything else is still sometimes a challenge! The rain is gone, the sun is out and I have big plans to do some major cleaning of the rabbit house today! It's a perfect time to let some rabbits out to play in their pen while I'm working in the sunshine.